Mike & I did an email interview for the Tokafi webzine. If there's one thing you can rely upon with this band, then it's their commitment to surprise: Even in 3003, S Club 8 couldn't sound like this. It's been quiet here on the blog for a while, but stuff is going on behind the scenes. 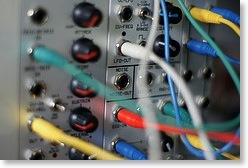 A couple of podcast updates have gone out, largely based on the ever-growing Darkroom modular synth. Check them out if you've not already - they offer some clues as to where you can expect the next album to be going. Also, on November 4th & 25th we indulged in a substantial amount of recording. Largely bass on the 4th, and all guitar on the 25th. 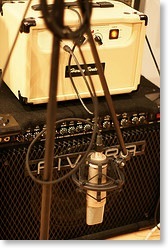 For the gearheads - Mike used a Harley Benton GA5 head & some nameless old cab, mic'd up with an SM57 and the previously blogged T.Bone ribbon. Pedals included the Space Echo, a tremolo, a phaser and any number of random fuzzes (often two at once). There's a good feeling in the Darkroom about this new album right now. To me it somehow feels more 'grown up' than anything we've done before. Definitely a progression from the last one, & we're still pretty chuffed with that. Some Of These Numbers Mean Something has been reviewed by Sound On Sound. I've decided to make a bit more effort to engage with Twitter. The Vimeo page is here. Vintage synths fans might particularly enjoy the sound of my Juno 6, which made its live debut at this gig. Or more properly, a new toy for The Lightroom, since apparently Mike's studio has been dubbed The Darkroom, and this beast lives in my studio. People have said we sometimes sound like Tangerine Dream. Expect that comparison to be made more often in the near future! Some Of These Numbers Mean Something has been reviewed - very favourably, I might add - by EvilSponge. Watch in HD and comment on the Vimeo page. The gig was not without its problems - e.g. our monitoring going a bit, well, broken between the sound check and the gig - but we came away happy with the result. The Vimeo page is here. Things start slowly but pick up in part 4. We did some more recording the other day. Two things worthy of mention. 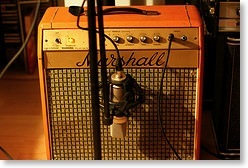 First, we used Mike's lovely old Marshall amp (pictured), which I'm particularly fond of simply because it's orange. As I recall, this was the amp that gave us the feedback sounds on Mercury Shuffle (on the last album, Some Of These Numbers Mean Something). This time it gave us some more screaming feedback, which was nice but not why we plugged it in, and some eerie slide guitar parts for an otherwise entirely synth-based piece (a rarity for Darkroom). Secondly, we tested out another new plug-in that I'm writing. More on that later. 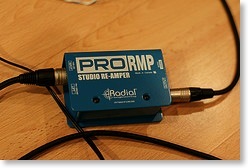 For now, know that it sounded awesome and we pretty much wrote a track on the spot based on its sound. The Vimeo page is here. Parts 2 and 4 are especially good IMHO. Some Of These Numbers Mean Something is finally available via subscription-based online retailer eMusic. Go get it here. Two new reviews from AMG and Side-Line.com - read them here and here. As threatened, I took a huge amount of video at the last Improvizone gig - in fact, I recorded the whole thing. Which made seven movies which you can see in the rather fancy widget below - or go to the actual Vimeo page where you can see them larger, leave comments etc. It's official - we're off to Antwerp this May to play at the Antwerp Loopfest. 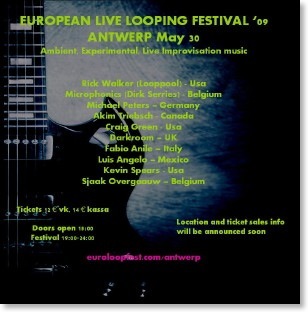 Or, to give it its full title, the EUROPEAN LIVE LOOPING FESTIVAL ‘09 ANTWERP MAY 30. The official festival site is here. Once more we'll be joined by drummer Andrew Booker. Apparently the whole festival is going to be recorded, so watch out for details on that sometime after May 30th, I guess. Just a quick note to point out that Last.fm have finally fixed the bug that was preventing Some Of These Numbers Mean Something from being available as more than 30 second previews on their site. So if you've so far resisted the urge to buy it, you can listen to the whole thing on demand here (provided you live in certain countries, anyway). Check out this episode of icescapes.tv, a video podcast dedicated to footage of the Arctic and Antarctic. Music by Darkroom - the podcast episode 'Calling Card 2'. Who'd'a thunk it? Camp Raven from icescapes on Vimeo. On Feb 8th Mike and I got together for a session, which promises to be the start of the next album. Currently the direction is back to the more ambient end of our output, possibly pursuing the drone-type sound we briefly explored in the podcast (e.g. in the track drone_of_4_4_7). Nothing gets the juices going like trying new gear combinations, and this time we tried a few new things. I had a new in-development plug-in to try out (more on that later) which worked gratifyingly well. We also tried out re-amping for the first time, which seems to be very much in vogue at the moment in all the music making mags. We re-amped my Prophet '08, and also re-amped Mike's guitar (so we could get the sound of plug-ins on the laptop feeding a guitar amp). All sounded good and I'm sure we'll be doing it again. You can see the amp rig in the photo - my trusty Rode NT-2A mic, Mike's extremely heavy Rivera combo being used as the cab, and the rather wonderful (and wonderfully inexpensive) Harley Benton GA5H all-tube head. I took a fair amount of video at the last Improvizone gig. The one you see here is the first 40 minutes or so, and the first 10 minutes of that Andy was still setting up the venue, while Mike and I essentially opened the night with a brief Darkroom set, joined by Nick on bass after a short while. The remaining videos are linked from the gig page. I've ordered a larger memory stick for the camcorder, so next time there should be even more to enjoy/wade through. 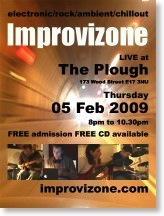 Improvizone returns to The Plough in Walthamstow on Thursday 05 February 2009 for the first gig of this year. The players will be the familiar quartet of Plough regulars, namely Michael Bearpark (guitar), Os (keyboard/laptop), Nick Cottam (bass) & Andrew Booker (electronic drums). We were chuffed to see that our song Chalk Is Organised Dust (from the latest album, Some Of These Numbers Mean Something), made it into nowlikephotographs' Top 24 Songs of 2008. Thanks guys! For the next short while you can listen to the whole two hour show in which they played these 24 songs. Listen here. It's "Episode CCXII - 2008.01.14" and our bit starts just over an hour in. Also - a shout out to "Doctor of Prog Rock" who mentioned us on his blog in his post "Some Other New Stuff I Liked In 2008". Not often you see a list that goes " ... Sigur Ros, TV On The Radio, Darkroom, The Verve, Coldplay ... ". There's been a lot of tie-in with the Improvizone podcast recently. The latest podcast track, the snappily named 'iz20080528_0033', is a version of a previous Improvizone download (this one) with the bass removed to make it a more ambient affair. Similarly, the previous Darkroom podcast track 'iz20080730endwashes' recently resurfaced on Improvizone, with bass and drums intact, here. The aforementioned article about Mike in Guitar Player magazine is now online here. Enjoy!